Jaclyn Michelle Linetsky (January 8, 1986 – September 8, 2003) was a wonderful and Canadian talented actress with a constant big smile.She was born and raised in a Jewish family in Montreal, she was the daughter of Larry and Terry Linetsky. Until her death, she lived in a Montreal suburb called Hampstead. Linetsky dubbed the English voice for the title character in the preschool animated series Caillou between 2000 and 2002. She also provided the voices for Bitzi in the 2002 animated series Daft Planet, Lori Mackney in What's With Andy? (2003-2004), and Meg in Mega Babies. In 2003, Linetsky was cast in a tennis-circuit themed dramatic show called 15/Love, for air on YTV. In an automobile accident near Montréal, Quebec, Canada Linetsky and co-star Vadim Schneider were killed while driving to the filming of an episode of 15/Love. Their vehicle, a rental minivan, lost control and collided with oncoming traffic. The death of the actors were put into the storyline with Megan and Sebastian being killed in a plane crash while on their way to a tournament, eveyone onboard was killed. Jaclyn and Vadim were 17 and only in 12 episodes of 15/Love before their death. Jaclyn was a very sweet, wonderful child, good-hearted and charming. She loved people, and she made everyone feel like they were important. We adored her, she impressed us so much. She made us think about a young Mary Tyler Moore. When she appeared on the screen she took up all the space, she had an immense charisma. She really had a gift for theatre. Her talent made her special, but her personality was what made her a unique girl. No day goes by when we don’t think of her. She inspires us, she enriched our lives and those of many other people, in so many different ways. She was a blessed child, who blessed us with her presence. We’re still blessed. Jacky was perfect, she was flawless. No one will ever convince me otherwise. Jaclyn was a rising television star. Beautiful, vital, bright and effervescent. Jackie was a typical 17 year old girl who happened to have a lot of talent. Regardless of her accomplishments she always worked very hard, and never let her ego get the best of her. Jackie was a wonderful girl, who got along with everyone. She never fought. She was a good student, and a kind girl.She was generous, and always a smile on her face! The reward for her was simply the applause and pleasing people. Jaclyn was such a good person .. She had everything going for her... She never let it get to her head.. She was always down to earth, and such a warm person. She was a very talented performer and will be deeply missed by us all. She always presented herself as just another one of the kids," said principal James Officer. Jaclyn was very comfortable in her own skin. It's a real talent snuffed out." 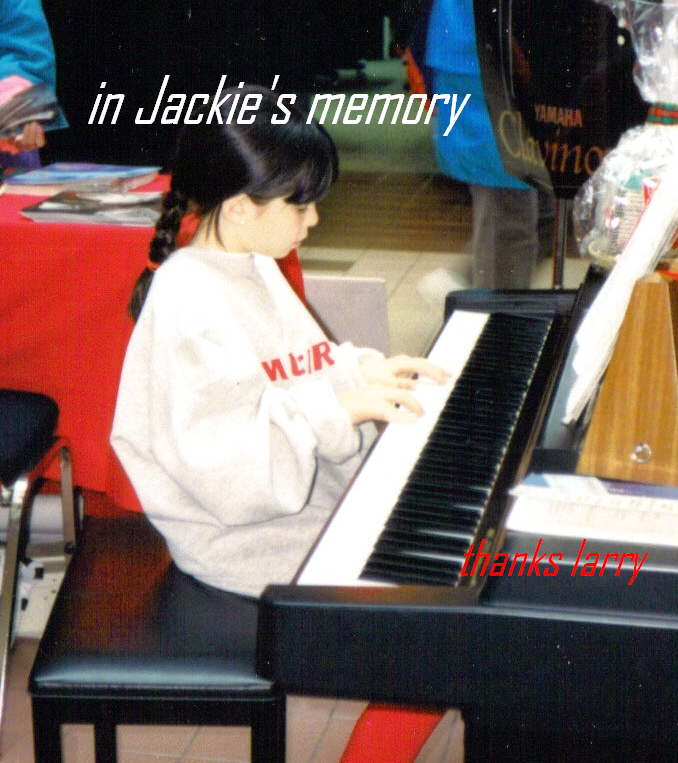 What always impressed us about Jackie was that there was this enormous talent and yet such a normal, nice young lady. The kids could see that she was the star, but she never stole the show. She always made sure there was a place for others, but she was always spectacular. Jaclyn Linetsky was a remarkable, accomplished young woman who touched the hearts of each and everyone with whom she came into contact.Nevertheless, in the seventeen years she was with us, she accomplished more than many have in an entire lifetime.